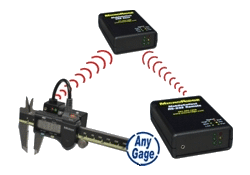 Wireless data collection makes it easier to bring your gage to what is being measured, rather than bringing what is being measured to your gage. Collect measurements with handheld gages (calipers, micrometers, etc.) and other instruments, and send data wirelessly to your PC. DataNet offers a wide variety of wireless transmitters and bases to give you a range of options and flexibility for wireless measurement collection. These wireless systems support a full catalogue of digital and RS-232 gages, scales and other devices from manufacturers such as Brown & Sharpe, CDI, Flexbar, Fowler, LMI, Mahr Federal, Mitutoyo, Ono Sokki, Starrett and Sylvac. For pricing information or to determine which hardware is right for your operation, call us at 1-866-4WINSPC or email us at info@winspc.com. Transmitters can be mobile modules or remotes used to capture measurements from digital and RS-232 gages and devices. Digital Mobile Module – used to capture measurements from most digital and RS-232 handheld gages such as calipers, micrometers, digital indicators, etc. Command Mobile Module – functions the same as the Digital Mobile Module, with the additional ability to send a command from a base unit to initiate a gage reading. RS-232 Mobile Module – supports RS-232 gages not supported by the Digital Mobile Module or the Command Mobile Module. RS-232 Remote – used when you have an RS-232 serial device, such as a gage interface or a scale, in a non-mobile setup that you want to connect to the wireless system. Bases receive measurements from mobile modules and remotes, and transfer the data to your PC. USB Base – receives measurements from Mobile Modules and Remotes. Connects directly to a USB port on a PC or a laptop and is powered by the USB port. RS-232 Base receives measurements from Mobile Modules and Remotes. Connects directly to an RS-232 serial port and is powered by a separate AC adapter. Internal antenna on USB Base and RS-232 Base. User configurable continuous read options. Features such as receiver energy detection and link quality detection are built in. All data is guaranteed reliable as it is processed with redundancy and checksum features. Instant on 250K wireless baud rate makes for extremely fast transmissions. No wireless transmissions are occurring until a reading is requested. Control over 15 wireless channels allows the user to operate in unoccupied frequencies.